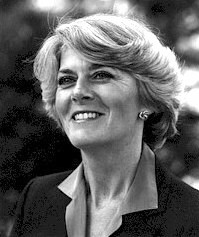 Geraldine Ferraro was Walter Mondale's vice-presidential running mate in 1984. She had been a representative in the U.S. House for six years at the time. She was the first woman to ever gain a slot on the ticket of one of the major US parties. During the 1984 race there was some controversy over Ferraro's husband's business interests. In 1999, she showed what a good liberal Democrat she is by signing on as a commentator for Fox News. During the 2008 Presidential Election, she supported Hillary Clinton. When Barack Obama took the lead for the Democratic nomination, Ferraro said that if he were a white man or a black woman, he would have been in the lead. Sarah Palin, John McCain's 2008 running mate. This page was last modified on 15 September 2017, at 18:21.